Phroilan Gardner is an fantasy artist who worked for Blizzard Entertainment for years during the 00s, contributing Diablo III concept art as well as creating a great deal of WoW artwork. He’s no longer with Blizzard, and since he left he’s been posting lots of cool artwork from his Blizzard days on his art blog. Most of it features WoW stuff, but in a recent post he added a couple of early Barbarian concept pieces, and a very nice concept art for a type of Viper we’ve not yet seen in the game. You see the finished models of a couple of types of Vipers in the thumb to the right, and we all enjoyed Brom’s awesome Tomb Viper painting, but nothing like Phroilan’s Vipers have shown up yet. They might not, after all it’s six year old concept art, according to the artist. 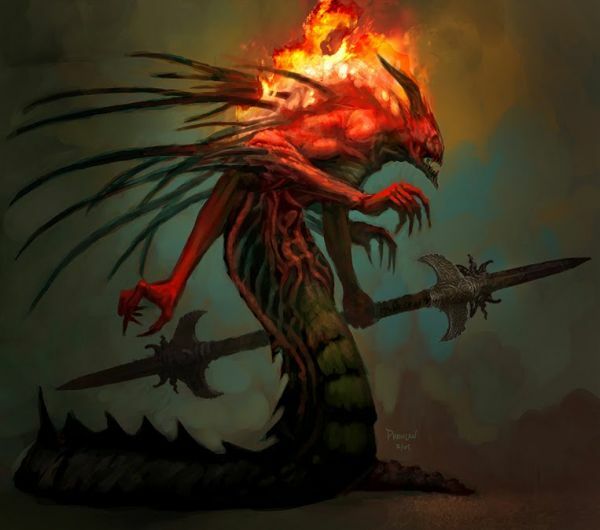 But I hope they did make it into the game, since a Diablo III without four-armed, spear-wielding, actually-on-fire, demon serpent men is not a Diablo III I want to contemplate. Thanks to Sinned from Diablo3.com.pl for the tip. seems like it doesn’t have the helmet as the original 400 limited number of collection statues. I guess that’s what separates the original one and this 750 reproduction. =( I would buy one if it’s exactly the same.